Summary: The history of Wood Green. Development from tiny hamlet to major shopping centre and independent borough; prominent buildings and characters; Alexandra Palace; transport; local industry; the impact of wars; and the development of new council estates. Told through still photographs and additional materials (e.g. maps, paintings, engravings, newspaper advertisements, motion footage). The Tottenham parish plan of Wood Green and surrounding area in 1617 (upside-down); and scan along the New River on that plan (the right way up). Bucolic painting of bargemen manoeuvring a loaded barge on the New River, watched by a young woman (“The New River, Near Myddleton Road, 1870” by C. Yardley). Drawing of well-dressed families in a field, park or common, c. late 1850s - conceivably some of the 200 ladies and gentlemen brought to Wood Green in July 1859 "for the inauguration of a new People's Palace" (artist unknown). Watercolour (“A rural scene at Bounds Green c. 1800” by William Payne) - sheep huddle in the corner of a field near large farm buildings, and a cottage in the background. The Old Three Jolly Butchers pub (1904) on Jolly Butchers Hill, with small groups of bystanders. Watercolour of H.B Chesser’s Farriers’ on Spouter’s Corner; with a young man standing in the wide-open doorway, a couple of children approaching, and the back end of a horse inside (Chesser’s Forge by J.E Slavery 1921). Watercolour of Green Lanes in 1850: a peaceful country road, leading to pretty thatched cottages, probably Wood Green, in the distance; as bystanders watch a rather indistinct herd being taken up a side lane (artist unknown). Painting of All Hallows Church, Church Lane, Tottenham in about 1830, seen across a field with a small cluster of sheep, and another of cattle (artist unknown). Mid C19th lithograph (by G.Hawkins) of St Michael’s Chapel of Ease; with a few people on the High Road and by the church gate, and Bounds Green Road stretching away into the countryside. Engraving of the “Asylum of the Fishmongers’ and Poulterers’ Institution, Wood-Green, near Hornsey” on what is now Wood Green High Road, with a few strollers nearby (Illustrated London News, 26/6/1847). 1858 print of the Printers’ Almshouses (a little further south on the same road); with a couple of cows, a hay cart and a few agricultural workers in the foreground. Two sections of an 1854 engraving of the Printers’ Almshouses, with cattle and strollers. Zig-zag effect. Late C19th /early C20th: A steam train at Wood Green (Alexandra Palace) Station on Station Road, with the driver and fireman leaning out of the driver’s cab. Front view of Wood Green (Alexandra Palace) Station, with barrow and bystanders. A tree-lined road, with buildings and a few people posing for the camera. The Elms, a large detached house opposite Spouter’s corner, c.1900. A group of lads by the Roundhouse in Town Hall Park on Wood Green High Road. Chitts Hill House, Wood Green High Road, probably in the late 1870s. Nightingale Hall on Finsbury Road (c. 1890). The first Alexandra Palace (1866-1873), with Rectory Road and Middle Lane in the foreground, and extract of that photo. Engravings: The second “Alexandra Palace and racecourse” (from The Penny Illustrated Paper, July 1875), showing the busy paths towards the racecourse at the bottom of the hill (not included in this reproduction). The first Alexandra Palace, with a simple animation of consuming flames superimposed. A small group viewing the blazing ruins of the first Alexandra Palace on 9/5/1873 (“The burning of Alexandra Palace, London – sketched from the north”, published in the Illustrated London News 14/6/1873). The destruction wrought by the fire, which continues in the background, as various people examine the ruins (“Interior View of the Ruins”, from the Illustrated London News feature on “Burning of the Alexandra Palace”, 21/6/1873). Closer view of part of that illustration, as two men talk, surrounded by twisted metal. Two couples inside the ruined building, presumably disaster tourists. Photo of the badly damaged exterior of the first Alexandra Palace (1873-4). The second Alexandra Palace seen (probably) from from the cyclist's track during the 1884 Cyclists' Camp; with marquees, bunting, a couple of spectators and an impeccably dressed dandy on a gentleman’s tricycle. Sections of an engraving - "The Opening of the Second Palace on 1 May 1875" - showing the crowded, yet still spacious, organ end of the Alexandra Palace Great Hall; the magnificent Grand Willis Organ and huge choir; and the vast surrounding audience. The crowd at the Alexandra Palace racecourse, with the grandstand initially seen to the right c.1890s. The Entrance to Alexandra Park, from the junction between Alexandra Park Way and Priory Road, as crowds leave the racecourse by foot and in horse-drawn carriages, before 1905. Alexandra Palace at night, seen across the boating lake. Motion footage (date uncertain) and dramatic still photos (perhaps c.1900) of various types of fireworks exploding, including one photo with Alexandra Palace silhouetted in the background. June 1889 newspaper article on a “Perilous Parachuting” accident at Alexandra Palace. Cartoonish drawing of a man hanging from a droopy hand-held parachute attached to a balloon. Fanciful illustration of "Messrs Williams and Young's Parachute Race at the Alexandra Palace" on 30 May 1889 (part of the June 1889 article). Dr Barton’s airship in its hangar at Alexandra Park, as crowds mill around below, before its ascent on 22/7/1905. Print of a Cody “war kite” in use, probably during S.F Cody’s 1903 exhibition at Alexandra Palace. A.V Roe adjusting the propeller of his Roe 1 Biplane at Brooklands Aerodrome in 1907. The Royal Masonic School for Boys on Lordship Lane, with a uniformed man in the pedestrian entrance (late C19th). Sections of a C19th engraving of teenaged boys playing various games (dice, ball, cricket) in a yard - "Boys of the Royal Masonic School at Play" from the Illustrated London News 1/5/1875. Close-up portrait of the uniformed man - perhaps the Headmaster. Extract of the Tottenham Parish Plan 1619 (the right way up, this time). Extract of a C19th photographic portrait of be-wigged Sir Ralph Littler QC. Wood Green Town Hall on Wood Green High Road in about 1920. Upper part of an engraving of Mrs Catherine Smithies, at home in Earlham Grove House. Extract of an engraving of Thomas Bywaters Smithies, published in the “British Workman” periodical to commemorate his death in 1883. Extracts of the lower part of the engraving of Mrs Smithies: two dogs; a framed bird picture and bound volumes of “Our Four-footed Friends” and “Our Dumb Companions. A copy of “Animal Ways” magazine, probably c.1961. Engraving "Arrival of the Obelisk Bounds Green Road 1879" - hauled by a train of horses, the obelisk commemorating Mrs Catherine Smithies is accompanied by workmen and an eager group of children (with the Fishmonger’s Almshouses and St Michael’s church in the background). The Face of Mrs Catherine Smithies, from the previous portrait. The obelisk and drinking fountain commemorating Mrs Catherine Smithies in around 1900, with a view of the junction between Bounds Green Road and Park Avenue. The obelisk in 1904, looking down Bounds Green Road towards St Michaels’ church in the distance. Idyllic 1895 engraving of the “Wood Green Cottage Hospital” (an alternative name for the Passmore Edwards Hospital), with strollers in the grounds. Plaque over the doorway of that hospital, recording its opening in 1895 as the Passmore Edwards Hospital. John Passmore Edwards - standing to the right - and other eminent citizens seated under and around a canopy frame, probably at the opening of the hospital. Jolly Butcher’s Hill in 1904, looking towards St Michael’s church, with quite a few pedestrians, a couple of horse-drawn carts and tram lines faintly visible in the foreground (the Elms was also just to the left, behind the trees of Gladstone Gardens). A Wood Green steam tram in 1890, with driver, conductor and a small band of onlookers. A horse-drawn tram by 353 Hertford Road in Edmonton, with driver, conductor and passengers (1895). Jolly Butcher’s Hill in around 1900, with pedestrians, carts and a horse-drawn tram; as well as the ornamental lanterns of the Nag’s Head pub to the left. Jolly Butcher’s Hill in the late C19th, at the junction between Wood Green High Road and Lordship Lane, with cloth-capped cyclists, pedestrians and horse-drawn trams. Front page of “The Wood Green Weekly Herald and North Middlesex Advertiser” (late C19th/early C20th). Notices about a band parade in support of the Local Reservists’ Fund and about the War Fund, probably from the Second Boer War (1899-1902). Painting of soldiers marching in Second Boer war uniform, accompanied by enthusiastic supporters (a man, woman and child). Newspaper ad for Dr Tibbles Vi-Cocoa, “prized like gold dust”, with a drawing of a Second Boer War soldier and his rifle. Advert for cycling lessons at Stanstead House on Tottenham High Road. Drawings of late C19th/early C20th safety bicycles (perhaps from an A.B cycle catalogue), including a ladies safety bicycle and a tandem. Late C19th /early C20th picture of smartly dressed men and women cycling together near a river (perhaps the Thames). The start of a 24-hour professional cycling race at the Wood Green Cycling Track on Bounds Green Road in August 1896. Closer detail of the intent riders, milling crowd and - almost lost amongst them - the man with the starting pistol. East Terrace of Alexandra Palace, with bystanders c.1901. Picture of the empty organ end of the Great Hall, with extensive seating and bunting. Notice in “The Sentinel” announcing the Grand Re-opening by the Duke of Bedford on 18 May 1901, with a Grand Concert, military band and free fireworks. The crowded Great Hall, with the entrance door and window at the back during "The Dedication of the Alexandra Palace to the Public" at the re-opening (Photo by Rose and Coop in the Sphere 25/5/1901). The orchestra, at the base of the Willis organ, separated from the audience by an impressive balustrade adorned with a row of busts, during the "Opening by the Duke". Newspaper portrait of Councillor Charles Townley. The Willis organ. The ornate Exhibition Hall and display cases, outside visiting hours. The beautifully decorated theatre, outside performance times, and its elaborate ceiling. A steam train coming into Wood Green and Alexandra Park station – also known as Wood Green (Alexandra Palace) Station - in around 1905, with an atmospheric moving smoke effect in the left corner. An electric tram passing the Nightingale Hotel, on the junction of the High road and Nightingale Road, in about 1905; and a couple of horse carriages. An electric tram on Jolly Butcher’s Hill, by the junction between Wood Green High Road and Lordship Lane, in about 1910; with pedestrians, and St Michael’s church in the background. Lymington Avenue in 1910, with a large canopied cart to the right, and young people posing for the camera in the road. The Fishmongers’ Arms, on the corner of Trinity Road and Wood Green High Road, in about 1906. Busy Wood Green High Road in about 1905, with the Kings Arms in the foreground. Riversdale Gardens off White Hart Lane (now behind Highfield Close), probably c. 1906, with a church to the left and the houses of Newnham Road towards the centre. White Hart Lane School c. 1906: Front of the school behind a row of trees. Young children opening the lids of their desks there, each decorated with a pair of cherries. The obelisk to Mrs Smithies, with workmen and supervisors, on the occasion of its move to Trinity Gardens in 1904; and the process of re-siting the obelisk. The packed window display of Bartons drapery store, 26 Wood Green High Road c.1906. Interior of Bartons, with cloth hanging from the ceiling, and attentive assistants behind the counter. A new electric tram car at Bounds Green with driver, conductors and a couple of others, perhaps at the start of electric tram services there in 1906. Side view of the electric tram from Muswell Hill to Alexandra Palace in about 1905, with well-dressed passengers and driver. Jolly Butchers’ Hill towards St Michael’s church in about 1905, with electric tram wires. Wood Green Tram Depot in the early C20th. Electric tram & horse cart on Jolly Butchers’ Hill c. 1910. Electric tram ascending Jolly Butcher's Hill towards Spouters Corner in the early C20th. The ornate facade of the Alexandra Park Tavern at 94 High Road, Wood Green c. 1910, as an electric tram approaches. Electric tram on the High Road, near the junction with Turnpike Lane c.1905. Electric tram on Station Road c. 1907, with Wood Green Public Library to the right (taken from Lordship Lane). The High Road entrance of Wood Green Public Library, probably close to its opening on 28/9/1907. Eminent citizens at the Station Road entrance of the library during the opening ceremony. A man carrying a newspaper in the late C19th or early C20th. The busy entrance to Barratt’s confectionery factory on Mayes Road in the late C19th/early C20th, as horse-drawn carts come and go. Women working in the caramel and toffee room at the Barratt’s factory in about 1950. The varied buildings of the Barratt’s factory in the early/mid C20th. Cole’s Potteries on White Hart Lane in the 1930s (from the Illustrated London News): A cloth-capped man – probably senior potter Bill Pearson - at work making a pot. Workers removing pots from the drying sheds and putting them into barrows in preparation for firing in the kiln (if I have understood the process correctly). Some of the buildings of Dovecote Villas and neighbouring Dovecote Hall (in the grounds of 9 Dovecote Villas) on the East side of the High Road, awaiting demolition in 1910; including signs concerning the forthcoming re-development. St Michael’s church at the corner of the High Road and Bounds Green Road, c.1905, with electric trams on both roads. The shopping parade on Myddleton Road, towards the junction with Whittington Road c.1912. The High Street shopping parade, between Nightingale Road and Truro Road, in 1903, with passers-by. Daniel’s Drug Store at 272 High Road, possibly with the owner in the doorway. Edwards & Co. Bakers and Confectioners on Jolly Butchers Hill c.1910; and the Post Office next door, with staff in the doorway (details from same photo). Advertising Poster for the Lordship Lane Cinematograph Theatre, probably in the early 1910s. The top of a poster announcing the opening of the Wood Green Empire in September 1912. The elaborate façade of the Wood Green Empire on the High Road, probably not long after it opened. Early programme sheets for the Empire, featuring music hall stars Vesta Tilley and Marie Lloyd. Spiral effect. A group of young men in straw boaters looking at a notice, probably one of the notices of mobilisation posted outside churches and public offices after the outbreak of war on 4/8/1914. Top of a WW1 “Your Country Needs You” recruitment poster. WW1 mobilisation notice from the Recruiting Office at the Tottenham Labour Exchange in Bruce Grove, calling for 100,000 men to sign up. WW1 recruitment poster, calling for 1,000 men to join the local 7th Middlesex Regiment at Recruiting Offices in Tottenham and Stamford Hill, following the air raids that began in 1915. Picture of a crowd responding to the appearance of an airship in the darkened sky over buildings - one pointing, some running (perhaps the Shutte-Lanz SL-11 airship shot down over Cuffley on the night of 3/9/1916; the Zeppelin L-31 brought down over Potters Bar on 1/10/1916; or the maiden voyage of the R101 airship on 4/10/1930 - passing over Wood Green or environs). The metal skeleton of the R101 airship, which crashed on 5/10/1930 in France. Programme from the Canadian Rink Cinema at 419 Tottenham High Road, featuring “The Wrecked Zeppelin” (probably 1916). Drawn women’s fashion illustrations: Advertisement for “The New Cuffley Coat” (c.1916). Autumn hat styles – two simply decorated dress hats and a semi-turban (c.1916). Two more picture hats with extravagant bows (c.1916). A heavily-laden pre-war peach basket hat, with rosettes & a swathe of ruched fabric (c.1911). Two blouses with softly-gathered bodices (WW1). Women’s union suit “emancipation” underwear (late C19th/early C20th). Two-tone ankle boots (c.1890s). A loose drop-waisted bridal outfit, cloche hat and veil (c.1923). A shiny evening dress with a long slim skirt, topped by two pleated layers and a shirt-style top, worn with a light mob cap (c.1920). Alexandra Palace in WW1: Belgian refugees awaiting dinner in a corridor, which is being brought out by a woman to the right (late 1914-early 1915). Great rows of beds laid out for the refugees in the Great Hall, with the Willis organ in the background, and female staff in the centre, dwarfed by the scale of their surroundings. German and Austrian internees in their compound in front of the Palace. The dedication plaque on the Wood Green War Memorial in Crescent Gardens on the High Road. Men celebrating Armistice Day on the 13A bus on 11/11/1918, seated not only on the open top deck, but also on the bonnet, and standing on the driver’s cabin roof; probably in Fleet Street, Central London. Women and children dancing at Armistice Day celebrations in an East End street. An East End children’s street party to celebrate the signing of the Treaty of Versailles in 1919. Diamond effect. Building in Dovecote Villas, awaiting demolition in 1910, and the beginning of the neighbouring shop (perhaps the original Bartons at No 26 High road). Demolition works along the High Road C.1910; men carrying out those works (one on a ladder); and the more-or-less cleared ground afterwards. Huge queues for the summer sale at the extended Bartons store in the early 1920s, and closer view of queuers. Bartons after the 1925 refurbishment: Inside the smart, open-plan colonnaded shop, outside opening hours, with women’s hats in the foreground. Another hat display there. New glass cabinets and chairs. Women shopping – looking at clothes; and at books. A poster advertising women’s summer outfits at Bartons in the mid-late 1920s, with drawings mainly of lovely 1920s dresses, but also of a bathing suit. The SoS Service Station sign, which shows that this early repair garage serviced both cars and tractors; and the entrance at 289 High Road, with cars (late 1910s/early 1920s). Drawing of a car - perhaps a 1925 Crosley Saloon. Part of the classic 1927 lithographed blackface poster for “The Jazz Singer”. Poster setting out the programme for Wood Green’s Central Cinema from 25-27/2/1929 - with “The Jazz Singer” heading the bill. Still from “The Jazz Singer”– Jack Rabinowitz (Al Jolson) at the piano in a tender reconciliation scene with his mother. Newspaper adverts for “Talkies” at the Wood Green Empire - Al Jolson in “The Singing Fool”; and Davey Lee in “Sonny Boy” (both August 1929). A billboard fence at the Junction of Green Lanes and Westbury Avenue in 1930, after demolitions in preparation for Turnpike Lane Station; with a title “The Track of the Tube”. The corner of the High Road and Lordship Lane shortly before demolition in 1930. Ranelagh House – a large detached house on the corner on Bounds Green Road and Brownlow Road – in 1930. Underground construction work on the cleared site at Turnpike Lane on 10/10/1930. Workmen sink the preliminary shaft for the underground at Wood Green in October 1930. A new underground tunnel, with officials, probably on breakthrough day. Front of Wood Green Underground Station in 1932, with commuters waiting to cross the High Road. (Probably) dignitaries greeting Sir Percy Greenaway, Lord Mayor of London, who has just left a stately carriage, while crowds line the street on Charter Day, 20/9/1933. Close-up of Sir Percy Greenaway c.1933. Top of the Charter of Incorporation for Wood Green. The Wood Green Borough Coat of Arms. Choir of 1700 Children in front of the Willis organ in Alexandra Palace on Charter Day. Float at the Charter Day celebrations. WW2: Auxiliary Fire Engine decorated with information about air raid precautions, outside the Fire Station at 3 Bounds Green Road. Barrage balloon on Wood Green Common. An Emergency Laundry Service van. Emergency Bath Service van at Noel Park. A mobile emergency canteen, operated by members of the Women’s Voluntary Service (WVS). Group photo of members of the WVS, in uniform. Rooftops in the evening. Night time c. early1940s: A gas streetlight. Wood Green Library. St Michael’s steeple. Fade to black. Severe WW2 bomb damage in Bury Road on 24/7/1944, with the mouth of an Anderson shelter exposed in the foreground. Severe bomb damage on West Beech Road, seen from Bury Road on the same day (two slightly different extracts of the same original photo). Sections of the Wood Green War memorial dealing with WW2. Stained glass window depicting St Michael, from the Tower Chapel in St Michael’s Church, Wood Green. Three more stained glass panels, showing Jesus in a central panel, flanked by followers to both sides. Preparatory photographs for the restoration of St Michael's after WW2: The inside of St Michael’s, with the font and west window at the end of the nave; and “Level” markings. Outside wall, at the base of the stained windows, with white markings. Workman carrying out repairs under the floor of the church. The inside of St Michael’s looking much brighter after redecoration, with the west window at the end of the nave, probably in the 1950s. The new Civic Centre (1958): Front view. Covered entrance. Book cases inside. Councillor Mrs Joyce Butler MP speaking at the opening ceremony, with the Mayor seated to her left and local dignitaries. Another view of Joyce Butler at that ceremony, with Alderman A.G Kendall to her right; and one of Mrs Butler unveiling the dedicatory plaque, with the Mayor seated to the right. Dilapidation, probably in the Winkfield Road/Acacia road area in the mid 1950s/early 1960s: Ground floor frontage of a boarded-up house. A broken window. An outdoor privy and basin. Peeling wood. Broken rubbish, including a framed picture, on the ground. Tall grasses waving slightly in the breeze. A broken pushchair lying upside down in a garden. An old tin bowl full of dirty water in the garden, with a flower floating on it. A workman fills a tip bucket from a concrete mixer, during the construction of the Acacia Road Estate, with the terraced houses of Acacia Road in the background. Workman at the wheel of a tip concrete dumper (largely unseen). Another workman operates the concrete mixer to fill the dumper bucket. The first workman drives the wet concrete in the dumper and tips it out for spreading by two more workmen on the site. Terraced houses on Acacia Road, with six-storey Acacia House at the end. Acacia House entrance sign. A three-storey housing block on Winkfield Road (also part of the Acacia Road Estate). Close up of a balcony in that block. Commerce Road in the late 1950s/early 1960s, before demolition: Street sign above a tailor’s shop. Row of small shops, with pedestrians, parked van & cars, facing the High Road at the end. Three toddlers running up a paved alleyway, probably behind Commerce Road in the 1960s. Boarded-up Victorian terraced housing – probably off Commerce Road, awaiting demolition. The shop sign for Minerva Football Co. Ltd. Signs on the side of an alleyway, probably for workshops behind Commerce Road. Shop sign for the Aluminium Box and Cylinder Co. Ltd. A housing block under construction in the early 1960s – probably Joyce Butler House or Basil Spence House on Commerce Road. Albert Victoria House on Pellart Grove under construction at around the same date. The Good Shepherd Mission Building on the corner of Berwick Road and Stirling Road c.1961. The church's bell and cross. Alexandra Park Library on Alexandra Park Road c. 1961, as a VW Beetle passes by; with the buildings on the corner of The Avenue visible behind. The “Branch Library” sign on the portico entrance, and the Wood Green coat of arms to the side, above. The new Three Jolly Butchers at Ashley House, 239 High Road c.1960: Pub sign. The front of the Three Jolly Butchers. The Alexandra Park Tavern, looking out of business, with “Sold” signs and possibly a busy fast food stall outside, c.1961. Close-up of “Sold” sign. Lorries at the back of the ATV production studio, in the late 1950s/early 1960s. Close-up of the ATV logo on a lorry. Two men (one in a workman’s dust coat, the other suited and perhaps in a supervisory role) carry a door out of the studio. The High Road c.1961, with passers-by and traffic: Macfisheries shop front (97-99 High Road). Lyons Tea House shop front (probably 51-53 High Road), with a new concrete lamp post outside. Bird’s-eye view of A.C Parker’s electrical goods shop, on the corner of Whymark Avenue, with the market stalls of father and son George and Tom Eden outside. Close-ups of radios in the shop window, as women with fashionable bouffant & beehived hair pass by; & of other electrical goods in the same shop. Close-ups of food and fabrics/bedding offers in other shop windows. Top of the art deco tower of Barton’s. The busy High Road around Marks and Spencer (No.46). Shoppers – mainly elderly. The High Road, looking north from just before the junction with Coleraine road, with new Concrete Utilities lamp posts. A concrete lamp post, with fluorescent GEC Z8270 lantern. Bird’s-eye view of the High Road, looking north towards the (hazy) tube station from around 3-4 The Broadway, with buses and other traffic (and new lamp posts). Shots of older people c. 1961, sitting on benches watching the world go by, reading a paper or strolling at Spouters Corner, one with Willis's garden plant stall in the background. The camera turns to show the view up the High Road. Front view of Wood Green Depot, after its conversion from trolleybus to bus use in 1961, and neighbouring Ashley House at 235-239 High Road. View along the High Road, as the camera turns from Ashley House to the neighbouring Printers’ Almshouses. Exterior of St Michael’s church. The Civic Centre – front view and details, including the Wood Green coat of arms. The beautifully kept King George VI Memorial Garden, with municipal flower beds and buildings at the corners of Ewart Grove in the background. View turning from the Fishmonger’s Arms, on the corner of Trinity Road to look up the busy High Road. Woodside House, 294 High Road, c.1961: Seen across the lawn in front. An older woman feeds pigeons in the gardens in front of the House, which is undergoing repairs. “Old People’s Centre” sign by the entrance to the Woodside House extension. A group of elderly people enter the Centre. Four men play a table game inside the Centre. Elderly people sit in a long row on comfortable armchairs at the Centre, one smoking. Busy traffic, including a Dodge Lad lorry, passing Wood Green library c.1961. Views of Wood Green from the South Terrace of Alexandra Park, or close-by, c. 1961: With the Hornsey Water Works in the foreground, and a train on the railway line in between. From further East along the South Terrace. The spire of St Michael’s church, through the trees. Wood Green and St Michael’s church. The 1617 Tottenham parish plan was the first map to record Wood Green. It was drawn up by I.T Barrow as part of a survey arranged by the Lord of the Manor, Thomas, Earl of Dorset (“the Dorset Survey”), in order to obtain an accurate account of his domains. It was published with north at the base, which makes it “upside-down” to modern readers. The film-makers have corrected this at the start of the film by turning the map upside-down, which means that all place names are the wrong way round, though it is later also shown the correct way up. The New River was developed in the early C17th to provide fresh water to London. Although the proposal was initiated, and early work carried out, by Edmund Colthurst, it was taken over by the more influential Sir Hugh Myddleton, MP for Denbigh, who became the person most associated with the scheme. Until 1852, the New River wound through Wood Green, as shown on the map at the beginning of the film. It was an incentive to development there, with a few of the larger houses backing directly on to the waterway. In 1852, a loop in the river was cut off to increase the flow, and the new course between the Myddleton Road and Station Road areas was tunnelled over. The land on top of the tunnel created a “green route” which was not developed and later became Finsbury Gardens, Nightingale Gardens and part of Avenue Gardens. I have made a rather speculative identification of the picture of well-dressed people in a hilly field, park or common as the 200 ladies and gentlemen brought to Wood Green in July 1859 "for the inauguration of a new People's Palace". This is by no means certain without further research, and it could have been a number of other events, or indeed an entirely different location. If it was that event, they would have been heading for the initial unveiling of the plans for what was later called Alexandra Palace, and surrounding residential developments, on the Rhodes Estate at Tottenham Wood Farm. The origins of these plans lay in the hugely popular Great Exhibition of 1851, which created a lasting (until 1936) memorial with the transplantation of the spectacular Crystal Palace to South London. This had been a major success, and Alexandra Palace was conceived on a similarly grand scale as a North London "Palace of the People", with both recreational and educational aims. Plans had been drawn up by architect Owen Jones, the interior designer of Crystal Palace and one of those involved in the Sydenham reconstruction. Wood Green was a small hamlet in the C17th-C18th, having doubled in size from around 50 to 100 houses. However, towards the end of the C18th it began to acquire important new facilities. In 1770 George Chesser set up a blacksmith’s shop at Elsa's Green (later known as Spouter's Corner), on the corner of the High Road and Lordship Lane. It remained in operation, and in the family, until the 1920s. There was also a neighbouring general store. The site is now occupied by the Hollywood Green cinema complex. The old “Three Jolly Butchers” pub was licensed in 1781, and was a coaching inn with livery stables, which also catered for drovers taking their cattle to market in London. It no doubt benefitted from having the blacksmith so nearby. The Watson family, proprietors of the pub from 1810 until the mid/late 1870s, owned much of the surrounding land, and so were important in the development of the area. Until 1844, residents of Wood Green would walk to the Tottenham parish church, All Hallows, to worship, which is no doubt why it is included in this film. In 1844, St Michael’s Chapel of Ease was consecrated, to serve the population of Wood Green. However, as the land was not very stable, it soon began to crack. With the population also increasing rapidly, it was demolished in 1859 to make way for the new St Michael’s church, a little to the south-east of the original building. The Asylum of the Fishmongers’ and Poulterers’ Institution (later known as the Fishmongers’ and Poulterers’ Almshouses) was just north of St Michael's church. It opened in 1849, having moved out of the City of London, and provided accommodation for 12 married couples. The illustration predates the opening by two years, and shows what it was intended to look like once completed. The Almshouses were demolished in 1955, and the Civic Centre opened on the same site in 1958. The Printers’ Almshouses opened on the other side of St Michael's in 1856, just south of Bounds Green Road, and also initially housed 12 couples. They closed in 1969, were demolished the following year and were replaced by Green Riding House - a telecommunications switching centre - in 1974 (still owned by British Telecom). As can be seen, both almshouses were initially established in a very rural environment. When the Great Northern line opened in 1850, it passed through the area but did not initially have a station at Wood Green. The Rhodes family, who owned Tottenham Wood Farm, realised that a station would greatly increase the value of their land and provided funding for Wood Green station, which opened in 1859. The station became Wood Green (Alexandra palace) station in 1864, changed its name to Wood Green station again in 1971, and became Alexandra Palace station in 1982 (the previous Alexandra Palace station on another line having closed in 1954). The Elms was one of a number of large villas which were built in the area in the Victorian period. It was demolished in the mid-1930s and replaced with Broadway Parade. The Roundhouse was the contemporary name for the “mushroom” entry lodge to the Town Hall Park, created in 1894 (now Woodside Park). It had been built in 1822 as an Entrance Lodge to another substantial mansion - Chitts Hill House, and is one of the oldest remaining buildings in Wood Green. Chitts Hill House had been built c.1805 as a country seat for City oil merchant James Clark, on land previously owned by Josiah Wedgewood among others. It was a fine mansion, in the latest Regency style, with views over the New River. It had a couple of celebrated additions over the course of the C19th. The second owner, Quaker banker John Overend, was responsible for the entrance lodge; and the third owner, city tea-dealer Samuel Page, added an acclaimed conservatory in 1876, as part of his extension works. The Page family left in 1881, and the estate was sold to the Freehold Cottage Dwelling Co. ltd, who began construction of the Chitts Hill Park Estate. The house itself was demolished in 1890 for the construction of Sylvan Avenue. Nightingale Hall was redesigned in the second half of the C19th, but datrd back to the Woodreddings Estate, which is recorded as early as 1392. It acquired the name Nightingale Hall in the mid-late C18th. By the mid C19th Nightingale Hall was occupied by a solicitor, Thomas Pearson. His wife, Mrs Pearson (who became Mrs Pearson-Kidd, after her husband’s death and her re-marriage) had, as a major landowner, a substantial influence on the development of Wood Green and St Michael’s church. It was demolished in 1894-5, and replaced initially by the Wood Green Cycling track and then in the first decade of the 1900s with housing – the Nightingale Hall Estate (Imperial and Eastern Roads; Northcott, Cornwall & Braemar Avenues). In 1860 a company was formed to take the proposals for the Rhodes Estate forward - the Great Northern Palace Company Ltd. That company did not attract sufficient investment, and in 1862 its successor, the North London Park and Land Company (Limited) specifically disavowed "any ambitious attempts to make their park a rival to ...Crystal Palace" . But clearly the initial inspiration was not so easily quashed. When the buildings of the International Exhibition of 1862 (a less successful follow-on from the Great Exhibition in South Kensington) became available, the opportunity to revert to the earlier intention was irresistible. A design using those materials - including the magnificent dome - was commissioned by the Alexandra Park Company (as the company running the project was now called) from Alfred Meeson, and building took place in 1864-6. Alexandra Palace struggled from the start to achieve financial viability, and the opening was delayed by a series of bankruptcies. It finally opened to the public on Queen Victoria’s 54th birthday, 24/5/1873, with great fanfare, and attracted over 120,00 visitors in its first two weeks. Like the original Crystal Palace at the Great Exhibition, one of the great attractions of the first Alexandra Palace was the magnificent "Father" Willis Organ. Rectory Road - seen in the photo of the first Alexandra Palace - was later redeveloped and no longer exists. Notoriously, the first Alexandra Palace burnt down on 9/6/1873, just a couple of weeks after opening, due to a fire in the dome - perhaps caused by workmen on the roof. The absence of a source of fresh water and the height of the building meant that although the whole Wood Green fire force was on the scene within 20 minutes, the fire could not be controlled until the building was a complete ruin and the Willis Organ destroyed, to the devastation of Henry Willis who risked his life trying to save it. The engraving of two couples inside the ruined Alexandra Palace may be part of a larger picture – perhaps also in the Illustrated London News. 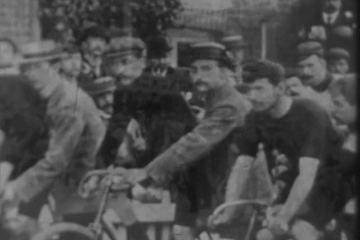 The placement at the start of the second Alexandra Palace sequence suggests the film-makers assumed that the photo of the gentleman tricyclist was taken during the cycle races for the re-opening of Alexandra Palace in 1875. However the tricycle design looks too advanced for that date, and the arrangement of the tents and marquees is more or less identical to that in representations of the five-day Whitsun Cyclists' Camp in 1884. Cycling had been developing as a sport and recreational pastime since the 1860s, when the bicycle was initially developed and the first cycle race was held. In 1876, the year after the re-opening, the tricycle also came to the fore, with the invention of the first popular model - the Coventry Lever tricycle ( a distinctive design with one large side wheel and two smaller wheels). Two and three-wheel cycling then ran more or less in parallel for some years, with many favouring the tricycle for its greater stability, especially when braking. By 1884 there were over 120 models of tricycle and 20 manufacturers. This was probably the peak year for tricycles, as the following year John Kemp Starley invented the Rover, the first commercially successful safety bicycle, from which time the bicycle began its climb to ascendancy. As road racing could be dangerous, awkward and controversial, a number of cycle racing tracks were built, the first opening at Preston Park in Brighton in 1877. London got its first track at Fulham the following year, followed by Chiswick in 1879 and Crystal Palace in 1880. If Crystal palace had one, naturally Alexandra Palace had to have one too, and a track opened there in 1882, within the horse racetrack. Meanwhile Harrogate had become a great centre for cyclists of all kinds, holding an annual Cyclists Camp from 1877. A number of "monster meets" followed, such as the Hampton Court Meet, which attracted 2000 cyclists to its parade in 1880. The 1884 Cyclists' Camp at Alexandra Palace was intended to capitalise on this trend and provide a southern equivalent to Harrogate. Unfortunately, the trend was by then in decline. The Hampton Court Meet was cancelled that year, after a major fall in attendance in 1883. Although the Cyclist's Camp attracted 1000 cyclists, and there were further major multi-day cycling events there in 1886 and 1887, the idea did not take root in the way that it had done in Harrogate. "The Classic Guide to Cycling" - written by Lord Albemarle, President of the National Cyclists' Union, and G.L Hillier in 1887 - records that despite some excellent racing, the 1884 Camp at Alexandra Palace was "a complete failure". It does not explain whether the numbers were considered disappointing, or whether there were other organisational failings. Having had such a successful first opening, funds were found to rebuild Alexandra Palace after the fire, this time to a design by John Johnson (a partner of Meeson). To avoid future water supply issues, this incorporated water tanks in four corner towers and four further reservoirs in the corners of the central hall, supplied by steam pumps from the nearby New River Company reservoirs. Henry Willis also set to work to create a new organ, widely regarded as his finest, tonally. It was operated by two steam engines which had to be fired up for 24 hours before use. A theatre was also added at this stage, although as John Johnson had little experience of theatre design it had a number of flaws - the sightlines were poor, rear balconies were too far from the stage, and there was no provision for scenery changes. Fortunately the stage - designed by T. Walford Grieve, from a set designing family - was more sophisticated, and made up for some of those shortcomings with features such as counterweight flying. The Palace opened once more on 1/5/1875, again with great fanfare, and attracted 21,000 visitors on the first day. The engraving illustrates the extraordinary capacity of the Great Hall, which could house a 2,000-strong choir, and an audience of 12,000. Alexandra Park first opened to the public in 1863, before the Palace itself was built. It closed in 1866-7 for the construction of new facilities, including a racetrack, trotting ring, and an imposing grandstand. The first horse races were held on 30/6-1/7/1868, and - despite a difficult start on that extremely hot weekend - racing was one of the more reliable earners for the Park Trustees for over a century thereafter, attracting large crowds to the "frying pan" shaped course. In September 1970, the Jocky Club withdrew its licence on safety grounds, bringing racing at Alexandra Palace to an end..
Fireworks were a part of the entertainment programme at Alexandra palace from its first opening in 1873, and the Bonfire Night Fireworks are still a hugely popular event there today (occuping two separate evenings last year, to accommodate the high demand). There was an interesting relationship between early developments in aviation, in particular for military use, and aerial entertainments at Alexandra Palace. Hot air balloons were increasingly coming into military use as observation vehicles in the late 1880s, but made an easy target, and so the development of parachuting became essential in parallel. Demonstrations of parachute descents quickly became a spectacular entertainment. The cartoonish drawing of a man hanging from a droopy parachute could be one of several people. American "Professor" Baldwin (a self-granted title) was the first to put on such shows at Alexandra Palace, and was hugely successful. He attracted 100,000 people to a benefit in September 1888 for the financially ailing Palace, for example; and the Prince and Princess of Wales turned up with their children to see his show that October. However, Baldwin's descents did not always go to plan (which was no doubt part of the attraction). On one occasion he damaged houses on Stroud Green Road when landing; another time he scared the elderly residents of the Printers' Almshouses; he landed in a tree in Highgate Woods; and once his balloon travelled all the way to France. Questions were asked in parliament about his activities, and it was suggested that he should be arrested on a charge of attempted suicide. The North Middlesex Chronicle sneered that "the almost forgotten parachute business, which is now advertised as the great attraction, ... is unfortunately only remembered for its fatalities". The Balloon Society, however, considered his experiments "a valuable adjunct to aerial navigation" (to quote Ron Carrington), and awarded him a gold medal. Despite the controversy over his activities, the Middlesex Magistrates renewed his license to perform, and the Home Office refused to intervene. The following year, he was joined by "intrepid American aeronauts" Williams and Young. At their first performance on 30 May, Young crashed outside Wood Green railway station and broke his arm. The article on "Perilous Parachuting" suggested that this might "induce the powers that be to consider whether such exploits are not fraught with too much danger to be allowed ... save in the cause of general science applied to military purposes". In the same year, Auguste Gaudron continued with a parachute display on 17 August despite high winds, ingeniously fastening his parachute to the side of his balloon in a manner that rendered it useless. He landed in an Oak tree in Harlesden. Professor Baldwin retired that year, but he had a number of successors including Dolly Shepherd, a home-grown female balloonist from New Southgate. In 1901 Dr Barton gained a contract with the War Office Ballooning Section to create and sell them an airship to his own design, patented in 1899. He needed to find somewhere to house it, and obtained a grant of £500 towards building of a shed from the Alexandra Park trustees, who saw it as a potential attraction. The shed was situated behind the lakeside cafe and boathouse. Dr Barton’s work was largely self-financed, which led to compromises in construction and difficulties recovering from setbacks, especially after his contract with the War Office ran out in August 1903. The Trustees of Alexandra Palace, representatives of the War Office and Aero Club, and many members of the general public came to see it take off on its first flight on 22 July 1905. It came to land in a potato field at Romford an hour later, but as the crew rushed to congratulate each other, they destabilised the craft. A valve used to release the gas split the balloon, and it never flew again. The Cody kite was more successful. It was patented by Wild West showman Samuel Franklin Cody in 1901, and built in the old banqueting hall at Alexandra Palace. He had probably become interested in kites due to his friendship with the balloonist Auguste Gaudron, a fellow Alexandra Palace performer. He offered his kite to the War Office as an observation vehicle for use in the Second Boer War. It made several demonstration flights around London, and there was a major exhibition of Cody kites at Alexandra Palace in 1903. The War Office eventually bought four of Cody’s kites, and he became very involved in early military aviation, being buried with full military honours after a private aeroplane crash in 1913. His kites were also adopted for meteorology, and he was made a Fellow of the Royal Meteorological Society. On 15 April 1907, A.V Roe won the £150 prize in a flying model aircraft competition at Alexandra Palace. The competition had been set up by Lord Northcliffe, who was concerned that Britain was falling behind other countries in aviation. Roe then developed a full-sized man-carrying version, the Roe 1 Biplane, which he worked on at Brooklands with the aim of winning a £2,500 prize offered by the Brooklands Automobile Racing Club for the first person to fly round its 3 mile circuit before the end of 1907. He missed that deadline, due to unresolved propeller problems which nearly killed him on one occasion, but may have eventually made the first British aeroplane flight on 8/6/1908. Unfortunately that flight was not properly documented, and so his rival Moore-Brabazon was awarded the official honours for the first British flight (by the Royal Aero Club in 1929) after he managed 500 yards in his plane on 2/5/1909. An aeroplane flight by SF Cody on 16/10/1908 might also be in contention for the title. The first Royal Masonic School for Boys was set up in 1857 to cater for the sons of deceased and needy Freemasons, and replaced in 1865 by the substantial Gothic building shown in the photograph. It moved to Bushey in 1898 and the building was purchased by the Home and Colonial Training Society, who opened a training college for Schoolmistresses there in 1904. Given the following sequence, I assume that the photo predates that change. In 1930 the site was sold to the Tottenham District Gas Company, who renamed it Woodall House after their chairman. It later became the offices of Eastern Gas. In 1974 it was acquired by Haringey Council, and is now used as Wood Green Crown Court. East India Company merchant Thomas William Smith Oakes had Westbury House built in around 1865 as a private residence. It was sold to the Chitts Hill Estate as Earlham Grove House in 1875. Occupants thereafter included philanthropist Mrs Catherine Smithies and her son Thomas Bywaters Smithies. Mrs Catherine Smithies founded the Band of Mercy animal welfare group, which merged with the RSPCA and was renamed the RSPCA Junior Division in 1935. Thomas Bywaters Smithies was a prominent campaigner for temperance and the welfare of the working man, and the proprietor of many philanthropic journals, including “British Workman”, “Our Four-footed Friends”, “Our Dumb Companions” and “Band of Mercy Advocate”. The latter was updated to suit contemporary taste and renamed “Animal Ways” when the RSPCA Junior Division was established. It appears likely, from a fuller version of the portrait of Thomas Bywaters Smithies in this film, that it was a cover illustration printed by “British Workman” on the occasion of his death. He seems to be seated in almost exactly the same spot as his mother chose for her portrait in 1883. This is probably no co-incidence, as he was very devoted to his mother, and arranged for the obelisk and drinking fountain to be erected in her memory in 1879. The obelisk was moved into nearby Trinity Gardens in 1904, due to the laying of tram rails. In 1850, Tottenham became one of the first parishes to establish a local board of health responsible for highways, lighting and fire-fighting (the precursor of today’s borough councils); and Wood Green was one of its six wards. On 29/9/1888, after a campaign by eminent QC Sir Ralph Littler and others, Wood Green broke away from Tottenham to establish its own local board of health. Sir Ralph Littler became its first chairman. The Wood Green Local Board of Health set up offices in Earlham Grove House in 1890. The area’s first public library was established there in 1892, and the Board bought the building in 1893. In 1894, Wood Green became an Urban District Council, with wider powers, including planning, sewerage and drainage, public health, and parks. At that point, Earlham Grove House became the Town hall. A public telephone office was added before 1900. In 1913, a one-story extension was built to house the Council Chamber and a magistrates’ court. After the opening of the Wood Green Civic Centre in 1958, it lost the Town Hall role - although it still provides Council services - and was renamed Woodside House. The Passmore Edwards Hospital (also known as the Wood Green Cottage Hospital) was opened in 1895 on the corner of Bounds Green Road and Gordon Road. It later became Wood Green and Southgate Hospital, which closed in 1985. The site has since been redeveloped and is now occupied by Passmore Edwards House, which provides sheltered housing, and the Bounds Green Health Centre. John Passmore Edwards was a journalist, publisher and activist who worked on causes such as the abolition of capital punishment, the suppression of the opium trade, temperance and the abolition of flogging in the services. He helped direct the Political Reform Association and attended peace conferences as a delegate from the London Peace Society. He purchased and edited various magazines – initially mainly promoting such causes - and in 1876 bought the “Echo”, London’s first daily halfpenny newspaper. He became Liberal MP for Salisbury in 1880-1885. He then became a major philanthropist, providing bequests to establish more than 70 major buildings (libraries, schools, hospitals, convalescent homes and art galleries) in London, the Home Counties and his native Cornwall. These included the Whitechapel Art Gallery, the London School of Economics, and of course the Passmore Edwards Hospital. Horse tramlines were laid from Wood Green to Manor House in 1887, but were converted to use for steam-powered trams that December (in fact, a normal tram attached to a steam loco traction unit). The steam trams were dirty, noisy, unpopular and too heavy for the rails. Horse-power was therefore re-introduced in 1891, and the Wood Green Depot was built, on the site of the current Arriva bus garage. The tramlines in the 1904 photo of Jolly Butcher’s Hill were used by horse-drawn trams, coming from the Wood Green depot. The depot converted to electricity later that year. The photo of a tram in Edmonton is no doubt intended to represent that conversion. The photos also show that thriving shopping parades had been developed on both sides of Jolly Butcher’s Hill by that time. “The Wood Green Weekly Herald” was founded in about 1890. The Second Boer War painting may represent one of the “Boer War Carnivals” organised in various London suburbs by the Daily Telegraph, to raise money for the widows and orphans of soldiers and sailors killed in South Africa. As previously mentioned, John Kemp Starley's invention of the Rover safety bicycle led to renewed interest in bicycling, which remained very popular as both a sport and a recreation in the 1890s, as the number of safety models increased. The Wood Green cycling track was opened in June 1895 on the former site of Nightingale Hall. It attracted audiences of up to 15,000 people during its five years in operation. It was then replaced by housing, with the development of Braemar, Cornwall and Northcott Avenues. Alexandra Palace suffered a number of closures and re-openings in the late C19th, due to continuing financial difficulties. In 1900, in an attempt to stabilise its finances, it passed into public ownership, after a long campaign by Sir Ralph Littler and others. The Park and Palace were purchased by a consortium of local authorities, who placed responsibility for management into the hands of trustees. The Palace closed in October 1900, and re-opened on 18/5/1901, in the usual extravagent style. Councillor Charles Townley - a interesting character with theatrical, council and masonic roles - was Head of the Entertainments Committee, and a lead figure in both achieving the re-opening and developing the programme thereafter. He was particularly keen to illustrate the "Imperial idea" through representations of all parts of the globe. The Theatre was, from this time to the outbreak of WW1, frequently used as a cinema, but closed in 1949 and was allowed to become derelict. A major restoration is currently underway, and it is due to open again in Spring 2018. Several substantial pub/hotels were constructed in the second half of the C19th on corner sites, with well-used meeting rooms attached. The Nightingale Hotel, for example, was built in 1866 and had adjacent Assembly Rooms and a Masonic Hall. It has since been demolished and replaced by a block of flats. The Fishmonger’s Arms was another, with Bourne Hall attached. The King’s Arms Hotel, built in 1870, had not only Assembly Rooms, but also a 25-horse stable-yard, which together became Stables night club at one stage. In recent years it has been The King’s and Charley Brown’s; and is now the Grand Palace Banqueting Suite. The expansion of Wood Green as a shopping area is shown by the photo of Lymington Avenue in 1910. These shops were later demolished as part of the Shopping City redevelopment. Riversdale Gardens was laid out as a small park some time between 1894 and c.1912, along the line previously occupied by the New River. The area has been substantially redeveloped since, and although the land is still open to the public, it is much less formal nowadays. The large buildings to the left - a church and hall - have since been replaced by the modern flats off Newnham Road, but the houses towards the middle of the picture are still visible. White Hart Lane Infants School was built c. 1900. The building was later used for adult education. It was demolished c.1990 and redeveloped as White Hart Lane Adult Learning Centre. Bartons began as a drapery store as a one-story building at 26 High Road in 1906, expanded to nos. 28-32 in 1910, and twice more in the 1920s to reach two stories and No.36 by 1925. It burnt down in the 1960s and the site was redeveloped to become the block containing British Home Stores (now also closed) and neighbouring shops. The Alexandra Park Tavern was originally built in 1868, and had adjacent tea gardens, but by 1910 the gardens had been replaced with shops, and the ground floor of the pub extended. It was demolished with the construction of Shopping City in the mid-1970s. Wood Green Public Library was built with a gift from the Andrew Carnegie Foundation, and stood on the site now occupied by River Park House. It was demolished in 1973. George Osborne Barratt began a small but successful confectionary business in Hoxton in te mid C19th, but looked further out when he needed to expand. The Barratt’s Factory was therefore established in a former piano factory in wood Green in 1880, and gradually acquired additional buildings until 1952. The Caxton’s Chocolate Factory, which was half owned by Barrett’s, also set up on the same site. Barrett’s was (effectively) taken over by the Bassett Group in 1966, and the Wood Green site was closed in 1980 due to consolidation of operations. The Barrett’s Office Building is now occupied by the Metropolitan Housing Partnership. The Chocolate Factory – a centre for cultural enterprises – also occupies part of the former Barratt’s/Caxton site. A couple of Potteries set up on White Hart Lane – the Cole and South Potteries - as there was a useful source of blue clay there. The Cole’s Potteries were established in the 1870s, and mainly produced plant pots for commercial use in the Lea Valley nurseries. They ceased production in 1955 due to tax changes, the arrival of plastic pots, and the sale of Lea Valley nursery land for development. The South Potteries also closed shortly afterwards. The Cole Potteries site is now occupied by Selco Builder’s Merchants. Dovecote Villas were 12 substantial pairs of semi-detached houses built in 1862. They were replaced by the Cheapside shopping parade and the Empire Theatre, to the South of Wood Green Shopping Centre. Dovecote Hall was a wooden shed used largely for the meetings of Baptist congregations in Wood Green – initially for a Strict Baptist congregation later known as the Wood Green Strict Baptist Chapel, then for the Hornsey Park Baptist Church, and then for an offshoot of the first group who later established the Dovecote Baptist Chapel. Myddleton Road had developed in the late C19th from the rural area seen at the start of the film. The shopping parade contained just four shops in 1884, but had 80 by its completion in 1912. The development of Wood Green High Road for shopping also began in the 1880s to the north of White Hart Lane, in an area known as the High Street. Daniel’s Drug Store was, I believe, in the building now occupied by the Tuna, Grill & Doner restaurant at 272 High Road. Some sources have placed it on the corner at the other end of Canning Crescent (which meets the High Road at both ends) but that location is shown before redevelopment, albeit hazily, at the end of Commerce Road in this film, and the arrangement of the first floor windows is very different. The Post Office next to Edwards & Co. was one of the earliest shops on the High Road, dating from the 1860s. The Lordship Lane Cinematograph Theatre was built in 1910 and closed in the 1920s, initially becoming a furniture depository and dancing school, and then an indoor market. It was demolished in 1999, for the construction of the Hollywood Green cinema complex. The Wood Green Empire was built at 7 Cheapside on the High Road as one of the Stoll-Moss chain of variety theatres, and was very popular until WW2, after which audiences began to decline. It also seems to have shown some films. It closed on 31/1/1955, and was then used as a production studio by ATV. The façade of the Empire can still be seen above the Halifax at 6-7 High Road. After WW1 broke out, on 4/8/1914, over 6,000 Wood Green residents volunteered or were conscripted to fight. At home, residents were subjected to Zeppelin and aircraft raids over North London from 1915. A couple of these resulted in dramatic crashes in nearby Southern Hertfordshire, at Cuffley and Potters Bar – although neither provided quite such a dramatic airship skeleton as the R101 airship crash in 1930. The R101 airship was developed by the British Air Ministry as part of the Imperial Airship Scheme at the Royal Airship Works in Cardington, to serve long-distance routes. On completion, it had overcome considerable technical challenges to become the largest man-made object ever to take to the air. In the gondola, it had two decks, a dining room which could seat 60 people, and a smoking room (!!). However, gaining sufficient lift was still an issue. It set off on its maiden voyage to India in reasonably favourable conditions at dusk on 1/10/1930, carrying 54 passengers and crew, including the Secretary of State for Air, Lord Thomson; the Director of Civil Aviation, Sir Sefton Brancker; and almost all of the airship’s designers. It passed over Alexandra Palace sometime between 8 and 8:30 pm, by which time weather conditions were deteriorating, it was raining heavily, and the engine had been shut down due to an oil pressure problem, later resolved by the replacing of an oil gauge. It made it across the Channel to France, but went a bit off-course, due to incorrect estimates of wind speed and direction; and was taken over the Beauvais Ridge, which was known for its turbulent wind conditions. It went into a couple of nosedives – the second exacerbated by a decision to reduce speed - and hit the ground, catching fire immediately on impact. Only 8 of those on board were able to escape the airship, and just 6 crew members ultimately survived. Britain’s airship programme was effectively abandoned as a result of this high-profile disaster. The positioning of the R101 photo in a WW1 sequence would seem to be a mistake – although perhaps the soundtrack briefly flashed forwards to later British airship development at this point (in which case the previous picture could also be of the R101 – which would explain the apparent enthusiasm of the bystanders). The Canadian Rink Cinema building was originally built as a roller skating rink and cinema, the rink opening on 14/2/1910 and the cinema on 19/3/1910. However the popularity of roller skating was waning and both closed on 25/6/1910. The building was redeveloped as the Canadian Rink Cinema, which opened on 29/6/1911. It had closed by 1925, possibly because the adjacent Palace Theatre had been converted into a cinema. The building then became a dance hall – the Tottenham Palais, later known as the Tottenham Royal and then the Aztec Temple nightclub. It was demolished in 2004, and replaced by a block containing flats and shops. The women’s fashion illustrations are probably intended to show the move away from very elaborate, structured and constricting garments to easier, looser styles, during and after the war. Alexandra Palace was promptly closed to the public after the outbreak of WW1, with the German invasion of Belgium on 4/8/1914. It was initially used for billeting cavalry. However, these soon departed overseas, and were replaced by an influx of Belgian refugees. By 20/9/1914 at least 3,000 beds had been installed, and 500 Belgians were in temporary residence. Refugees continued to be billeted there until 28/3/1915, by which time 32,000 Belgians had stayed there, on their way to longer-term accommodation. From 7/5/1915, and for the rest of the war, it became an internment camp for German and Austrian men aged 17-55, resident in the UK. The Wood Green War Memorial was unveiled on Armistice Day (11/11) in 1920, as a monument to the 800 men from the area who had died. It was paid for by public subscription. A further tablet was added in 1922, to include a further 180 men and 2 women. It would seem that the film-makers resorted to photos of London in general to illustrate the post-WW1 celebrations. The “Cambria Daily Leader” sign in the bus photo led me to identify this as Fleet Street, which would fit the likely bus route. I have taken the “East End” attribution for the following photos from the same shots and/or shots of the same events in Getty Images, and believe that to be correct, largely due to the flat roofs in fuller versions. However, I note that Tottenham is described as “East End” in similar shots, so they could be more local than I suppose. In 1901, a fire engine house was built next to the Fishmonger’s Arms at 289 High Road. A new fire station was built on Bounds Green Road in 1914, and the High Road station presumably closed at or shortly after that time. By the 1920s, it would seem that the building had been taken over by the SoS Service Station. Part of the building still exists within the Bounds Green and Alexandra Wards Police Station, while part was demolished and replaced by the Wood Green Timber Co. Ltd. The Central Cinema opened at 35 Station Road c.1915 and remained open until WW2, after which it became a warehouse. The building was demolished in the 1960s and replaced with council offices. “The Jazz Singer” was the first feature-length part-talkie film containing synchronised music, singing and speech (although there were previous films with some talkie characteristics). It was released in the U.S in October 1927, but didn’t arrive in the UK until September 1928. It featured a Jewish character, Jake Rabinowitz (played by Al Jolson) who becomes a blackface jazz singer despite strong parental disapproval. The film was a major hit. Al Jolson starred again in the similar 1928 talkie film “The Singing Fool”, which contained the hit song “Sonny Boy”, and was even more financially successful. It seems likely that “The Singing Fool” was released in the UK in summer 1929 (after the Irish release). 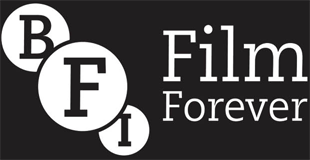 The Wood Green Empire became a full-time cinema for the film, and continued to show mixed cinema and variety programmes until the mid 1930s, when it returned to largely variety use, with the exception of Sunday film programmes. “Sonny Boy” is another part-talkie, in which Warner Brothers re-use the hit song. These three films all seem to have reached Wood Green in 1929, when local cinemas first converted to sound. At the beginning of the 1930s, skilled miners were brought down to London to work on the extension of the Piccadilly Line from Finsbury Park to Arnos Grove. Underground stations at Turnpike Lane, Wood Green and Bounds Green were designed by Charles Holden, in fine art deco style; and were opened in September 1932. Ranelagh House was the residence of Mr J. Mann in 1930. Wood Green was granted a Charter of Incorporation making it a Borough Council on 26/6/1933. The Charter was formally presented by Lord Mayor of London Sir Percy Greenaway on 20/9/1933, Charter Day. I believe that the photo of the stately carriage must be of the Lord Mayor’s arrival at the Charter Day celebrations, although I cannot be certain as the details are rather indistinct and I have not seen it elsewhere, or seen any other photos of that event. The Coat of Arms was designed for the opening of the new Council. The Motto “Nostrum ~Viret Robur” can be translated as “Wood Green Flourishes” or “Our Strength is like a Green Tree”. Celebrations continued for four days. WW2 was declared on 3/9/1939 and, like WW1, meant conscription and air raids for the people of Wood Green. Barrage balloons were immediately raised throughout the city, a British Balloon Command having been established the previous year with the aim of hindering air attacks by causing collision with the cables and making the approach more difficult. There were 66 air raids in Wood Green, causing considerable damage to property, 300 injuries and 84 deaths in the local area (plus 67 civilian deaths of Wood Green residents outside the area). The West Beech Road/Bury Road area was hit by a V1 flying bomb at 11.55 pm on 24/7/1944. The photos of the devastation were taken the following day. The Women’s Voluntary Service manned (womanned?) various mobile emergency services, to provide for the basic needs of those whose homes had been bombed, for example. A further 254 Wood Green residents died in action, as members of the armed forces. An inscription was added to the Wood Green War Memorial and unveiled on Armistice Day, 9/11/1947. Although it is hard to tell from the image in this film, the St Michael stained glass window is relevant during the WW2 sequence due to the dedicatory “scroll” to the bottom left, “To the Glory of God and in loving Memory of Arthur Ronald Milton, aged 23, who died on Active Service , March 1943.” The St Michael window was created by local company Cakebread Robey (founded in Stoke Newington, but with an office in Wood Green). The other panels shown date from 1893. St Michael's continued to suffer from the instability of its site. A programme of restoration was halted by the outbreak of WW2, and by the end of the war it was in a dangerous condition. The outside walls were cracked, pillars and arches were moving, pews sloped, and the floor of the nave was 9" below its proper level. Fr. John S. Aldis, who took on the ministry there in 1949, had to have the arches shored up and stabilised, pillars built on new foundations or underpinned, a new floor laid, and the south aisle strengthened. He also took the opportunity to beautify the church and make certain changes to the interior arrangements. A church history describes him as "The Builder" and says that "To say that thanks to him we have a building today is no overstatement.... He saved it from the rubble." The new Civic Centre was opened on 15/3/1958, and is unique as the only Civic Centre built in London to a contemporary design during that decade, earlier plans having been shelved due to the war. The exciting modernism of its design, both inside and out, is evident in these photos. The Victorian terraces of Acacia and Winkfield Roads were built between 1864-1876, but by the 1950s were not up to modern standards and becoming dilapidated. The Acacia Road Estate redevelopment scheme was one of several in the area initiated in the late 1950s, to replace those terraces with modern council housing. Both of the new blocks in the film are still there, though the façade has been renovated in new colours. Commerce Road was developed from in the 1850s as mixed-use area with shops and housing, backed by industry and small workshops. The Commerce Road Redevelopment Scheme was the last major building project carried out by the Municipal Borough of Wood Green before its replacement by the London Borough of Haringey in 1965. It was inaugurated on 7/4/1962 by Sir Basil Spence, and demolished the existing buildings for replacement by council housing. The Minerva Football Company Ltd was founded by the Metselaar family. Adrian, Piet and their father were refugees who had cycled from the Netherlands to escape the German invasion. They had passed through the clearing station at Alexandra Palace before settling in Potters Bar. Adrian Metselaar got a job with a football manufacturer in Borough after the war, and was joined there by another brother, John. In 1953, they started their own independent football making business, naming it Minerva after the Roman goddess of sewing and craft. They were (and are) highly successful, supplying training and match footballs to professional teams in the UK and internationally. They also supply balls to more amateur teams, and for other sports e.g rugby and netball. They are now based in St Albans. The Parish of St Michael, Wood Green, first established a Mission Building on Berwick Road in 1916, to provide a local district church for the Scotch Estate. It was made of wood and corrugated iron, and was second-hand, having already been used in Neasden. After WW1 it gained a hall, which provided space for many local organisations e.g Scouts, Guides, a Youth Club, a Men's Club, a Mother's Meeting & the Ladies Sewing Guild. Dry Rot was discovered in the building in1956, but Fr. John S. Aldis was at hand, and after fund-raising and the sale of some land, the new dual-use hall/church seen in this film was built and dedicated on 20/7/1961. In more recent years, the congregation dwindled, and the Bishop of Edmonton (who now had overall responsibility for the parish) decided to withdraw the bishop's licence that allowed Church of England services there. The building was sold to the Eritrean Bethel Church In 2003, and the proceeds were used for further emergency repairs to St Michael's. Alexandra Park Library was built on the site of a former allotment, after residents petitioned Wood Green Council for a library local to their area. It opened in 1961, and continues to provide a full library service. The Three Jolly Butcher’s had been redeveloped to suit contemporary tastes by 1900, but was demolished in 1959 to build Ashley House, an office building – albeit one with a redesigned and somewhat reduced Three Jolly Butcher’s pub on the ground floor. In the last few decades, it became the Rat and Carrot; Ganleys; and it is now Monaghan’s Tavern. Following the lead of the BBC, which had taken over the Shepherds Bush Empire in 1953, the Associated Broadcast Development Company (ABC) repurposed the Wood Green Empire Theatre building as a production studio when it was awarded the franchise to provide the Independent Television service at weekends for the London area from September 1955. They rapidly had to change their name to Associated Television (ATV), as there was already an ABC cinema chain which was about to launch a television service. It remained their main London Studio for some years, and programmes made there included “The Strange World of Gurney Slade”, “Emergency Ward 10” and “Probation Officer”. However, ATV also took over the Hackney Empire in 1956. Both studios were decommissioned after ATV took over the former National film studios at Borehamwood, and the Wood Green Empire became derelict in 1963. A couple of years later, the auditorium was demolished, and Sainsbury’s was built on the site. The site at 6-7 High Road is now occupied by the Halifax. However, the façade of the Empire can still be seen above the building society. In the 1960s, J. Woods greengrocer’s was demolished and replaced by Macfisheries, the first self-service supermarket in Wood Green. The building later had several other occupiers, and is now part of McDonalds. I believe the Lyons Tea House was at 51-53 High Road, where Traid is at present (based on visual matching rather than any definite published source). A.C Parker's shop took over a spot previously occupied by Ajello's piano shop c. 1905, and then the WG Electric Palace Cinema from 1910-1920. Marks and Spencer had arrived on the High Road in the late 1920s, and took over the site of the Palladium Cinema at 46 High Road c.1934. It closed on 26/9/2015 (followed by British Home Stores a year later), and the space is now occupied by a Factory Outlet. The Marks and Spencer footage in this film still has trolleybus wires, which would probably date it before the trolleybus service ended in 1961. It seems that new lampposts - in the very latest style - were introduced on the High Road at the end of the 1950s or very beginning of the 1960s. Spouters Corner was a space where a significant number of people could gather, and acquired its nickname because, from the late C19th at least, it attracted political speakers. The first recorded political meeting there was a Reform League event in 1867, and it became a venue for Suffragette rallies and Trade Union meetings. It also became an area where casual labourers gathered, before Labour Exchanges were introduced in 1910. In the late 1950s-early 1960s it was still attracting political speakers, and CND meetings were held there. In the 1970s, it hosted anti-rascist and anti-fascist meetings. However here it is seen in mellower mood, as a hang-out spot for the older residents of Wood Green. Willis's plant stall had a sign that read "If it grows, we sell it. If we sell it, it grows". Electric trams had been replaced by trolleybuses in the late 1930s. In 1961, these were in turn replaced by diesel motor buses, and the depot became a bus garage. Wood Green Bus Depot is still in use by Arriva. In the 1950s and 1960s, the Bourne Hall, attached to the Fishmonger’s Arms, became an important music venue, first housing the Wood Green Jazz Club and then in the 1960s-70s featuring performances by various high profile singers and bands e.g Gene Vincent, Eric Clapton, The Kinks, Cream, Led Zeppelin, Jethro Tull, Pink Floyd, Rod Stewart, Status Quo, Manfred Mann, Judas Priest & Roxy Music. The Fishmonger’s Arms later became O’Rafferty’s. Since 2007, the upper floors of the building have been converted into flats while the ground floor is now used by the Bounds Green and Alexandra Ward Police Station. The original pub name is still visible on a plaque by the roof. Most of the paintings, maps, engravings, photos etc used in this film have been reproduced in slightly trimmed form. (Researched for London’s Screen Archives by Zoe Roberts in Spring 2017). “Wood Green Through Time” by Albert Pinching (includes many of the archive photos and pictures included in this film - uncropped & in colour where applicable). "On Two Wheels In Front" by Alf Layzell, printed in the Tricycle Association Gazette Autumn 1957 (on their website - see below). Residents of Wood Green Re-United (with special thanks to Peter Chorley, Sharon Lennox, Rosemary Parry, Sue Barrott, Jenny Collins, Margaret Hannan, Christine Cobden, June Silvester Daniels, Linda Phillips-Askew; Glyn K-Wood, Hugh Adams, Donald Barker, Pete Taylor, Carol Eden, Peter Porky Bacon, Dave Martin, Gary Voller, Mike Davis, Wendy Nickless-Roberts, Jennifer Unite, Kim Nicholls, Alan Brett, Keith Simpson, Sharon Shoop, Vicki Davies, Tom Callaghan, David Cole, Jan Donnell, Jo Jo Rippingale, Maggie O'Mahoney, Glenda Willett, Christopher Forde, Trevor Chapman, Maxine Sobers, Esther Russell, Esther Baines, Ella law, Jackie Chorley, Maria Griffin Ne Vella, Andrew Hemingway, Glyn K Wood, Maureen Moss, Carrie & Joanna Forde ). Bowes and Bounds Connected (with special thanks to Hutch Woodward and Richard McKeever). My grandfather grew up on Mosell Ave. tried to find the house a few years ago but it was gone. Perhaps during the war? Last name Evans. I thoroughly enjoyed my first view at Bruce Castle last week as I am a long term resident of Wood Green, and many memories returned from my youth.